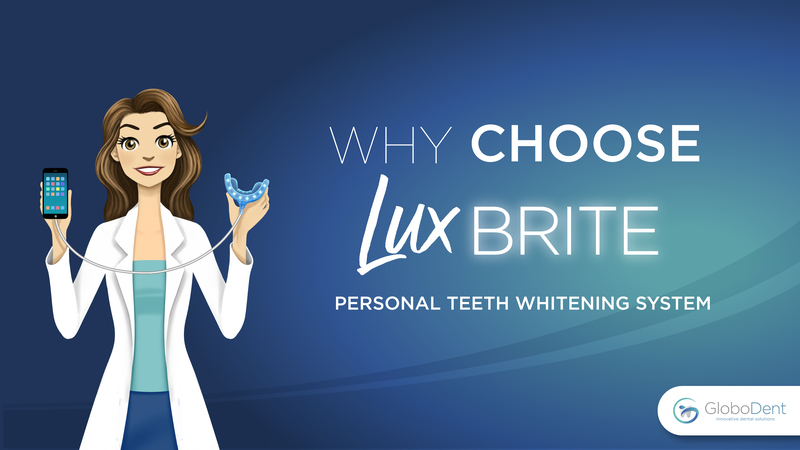 GloboDent | Why Choose LuxBrite? LuxBrite was designed to be used at home. LuxBrite Kit includes a friendly user manual that´ll guide you step by step through its usage. Our manual also includes tips on maintenance and retouches. Unlike many at-home products out there, every GloboDent product includes Globodent´s Remineralizing Gel, which is designed to strengthen and remineralize dental enamel while decreasing risks of teeth sensitivity. Using the remineralizing gel for 3 to 5 minutes after the procedure will help with any risk of sensitivity. GloboDent´s website features a Q&A section and a live chat. Both runned by the specialists behind GloboDent´s products. Who could be better to answer any question or inquietude you may have? LuxBrite kit includes enough whitening gel for 15 sessions. You can also purchase LuxBrite Refill Wit on our website after those 15 sessions are done. Our very own teeth whitening shade guide is included on the kit for you to easily spot your beginning tone, and target your final goal tone. Remember that with LuxBrite you can lighten your teeth color up to 8 tones. LuxBrite works with any smart device and our kit includes iPhone, Android and USB adapters. GloboDent warrants its products for two years after purchase.